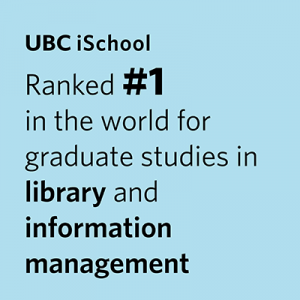 We’re excited to announce that UBC iSchool has a new name and new logo: UBC iSchool (Library, Archival and Information Studies), or UBC iSchool for short. This new branding aligns us closer to the university and reflects our position as a research program. Although our alumni will continue to think of us fondly as SLAIS or the iSchool@UBC, we encourage our community and industry partners to use our new name, simply UBC iSchool. We will continue to update our website, official forms and other signage throughout the summer to reflect our new name and look. Any questions or concerns about the new brand, or requests for logos can be directed to ischool.comms@ubc.ca.